Good numbers of chrome steelhead entering the rivers daily! Longer day light and a bump in the water levers – Got Steelhead on the move! My prediction is that the main steelhead migration will take place in early march, with heavy spawning in later March and early April, with Steelhead fishing, finished by April 15th. We had a year like this about four years ago. 80 degree days in late March. All the Steelhead came into the river, spawned, and left the river by April 15th. (That was the year that all the Apple trees in Michigan blossomed, and then were killed by a heavy late frost, and there were no apples that year.) I’m expecting this steelhead season of 2016 to have the same effect. We had 20 fish, in the net days, for about two weeks, then steelhead fishing tapered off. They were gone, back to Lake Michigan. If you were thinking about booking April dates, I’d suggest a March date instead. Finally some warmer weather ahead in the forecast! It finally feels like spring once again! Bright chrome spring steelhead are starting to enter the lower parts of the river! Just a few more days of tying flies, painting beads, and spooling reels. Soon it will be prime time and we are chomping at the bit for the first few warm rays of sunshine! Stone flies will start playing a larger part in the Steelhead’s diet. Small Black stone flies, and salmon fry patterns should start producing fish. We are offering both guided half day ($250), and full day ($350) fishing adventures for light spinning tackle (Float Fishing) and chuck and duck style fly fishing for steelhead and trout. Both techniques are very easy to learn and produce a lot of fish in the net! Usually over one steelhead per hour or more, and plenty of resident Brown, and Rainbow trout. This year’s class of steelhead has been larger than average, with new fish entering the river daily. Water levels have been stable so far, usually around 2000 cfs. Making for excellent steelhead fishing. Wading has been decent at these levels. Stream flow should remain normal throughout most of the spring. We don’t have huge amounts of snow to create high water this year. Warmer Weather and Excellent fishing coming soon! 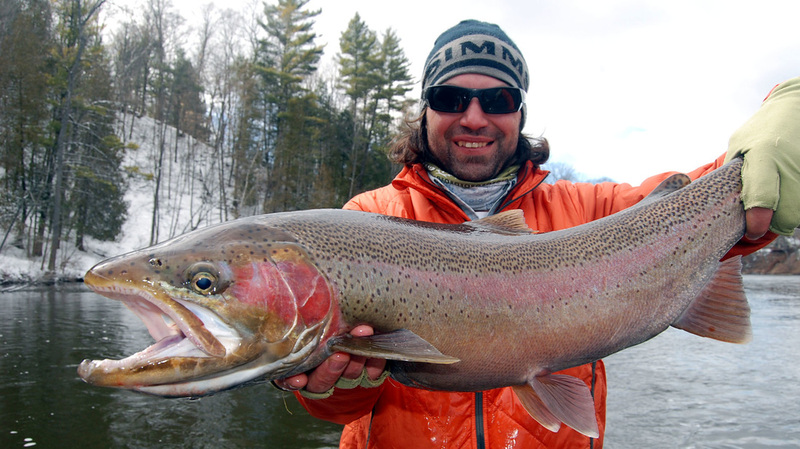 Click here to purchase custom tied Spring Steelhead Flies for Michigan. Mojo Steelhead Flies. New FaceBook Fishing Reports page. Give us a like and subscribe to fishing reports for the Muskegon and Big Manistee Rivers.